There are a number of other possibilities than shown here. However, these two are the most plausible. 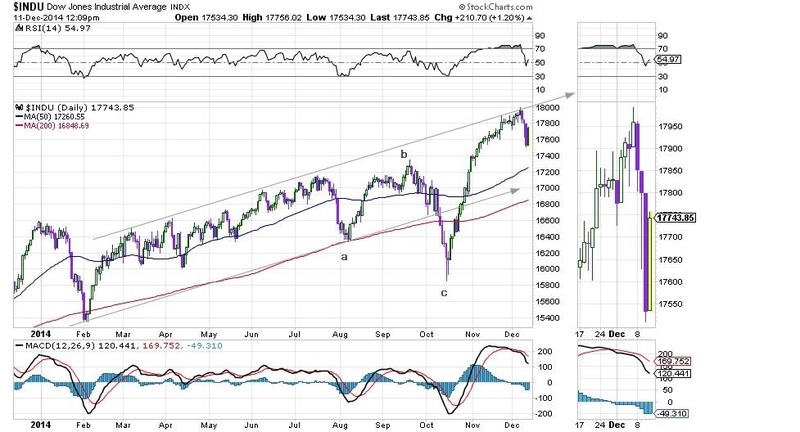 One is a large a-b-c correction that would later lead to new highs. We do not think so as the recent drops are totally out of proportion. The other is that the real bear market has started and we are in wave 3, more precisely 4 of 3 or more bearishly, 4 of 3 of 3. Either way the large ups and downs fit well with the notion that we might be tracing out a triangle pattern (typical for 4th waves). This should take us through the weekend and then we will continue with 5, or 5 of 3 and 4 and 5. The whole thing should take us down to about 13200 or lower. 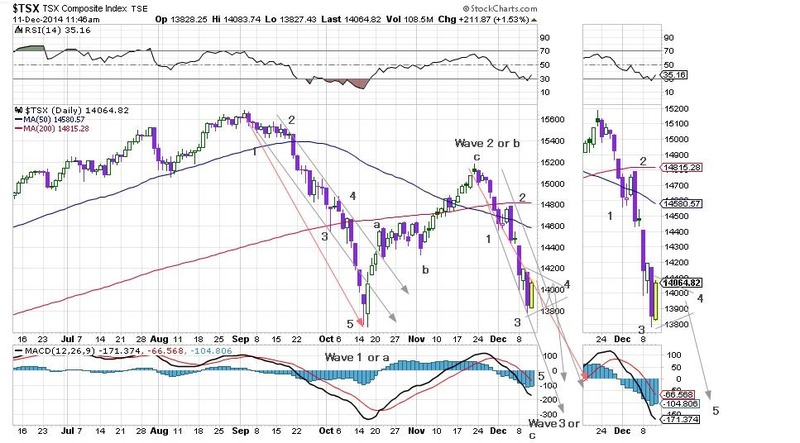 The DOW shown below, is clearly “out of phase” with the TSX. No idea why but obviously low oil prices are generally good for the US and not necessarily for Canada. So far this is the first clear manifestation of the coming deflation. It will have to metastasize to other areas like housing, banking etc. before it takes hold of the US economy. In the mean time their plunge protection team is far more skilled than ours. They have barely budged.